This post may contain affiliate links, which means I may receive a small commission, at no cost to you, if you make a purchase through a link. Hey, Creatives! Are you looking to give your site traffic a boost this month? If so, this post is for you! Recently I just jumped on Tailwind tribes full force and to my surprise, a lot of my website traffic is coming directly from Tailwind tribes. Because of the increase in traffic, I decided to really focus on Tailwind tribe and put tribes into my current Pinterest strategy. Just last week I reached over 1 million Pinterest monthly viewers in less than 3 weeks. From my Google Analytics results, Tailwind tribes had a part in the rapid growth. Not only did my monthly Pinterest views increase but my page views on my actual website doubled! This post will go over what Tailwind tribes are, how to use them and how to boost your traffic each month using them. Tailwind tribes are apart of Tailwind. Tailwind is a Pinterest scheduler that you can use to promote your pins daily. It’s a great tool if you are looking to grow your Pinterest account on autopilot very quickly. Tailwind has been credited by a lot of bloggers as one of the best platforms to grow your traffic from Pinterest in a short amount of time. You can save time throughout the day by setting up a scheduler to pin your pins on Pinterest. You can study the Tailwind analytics to see which times are the best times to pin for your content. You can find out which personal and group boards are performing the best and which ones aren’t performing as good. 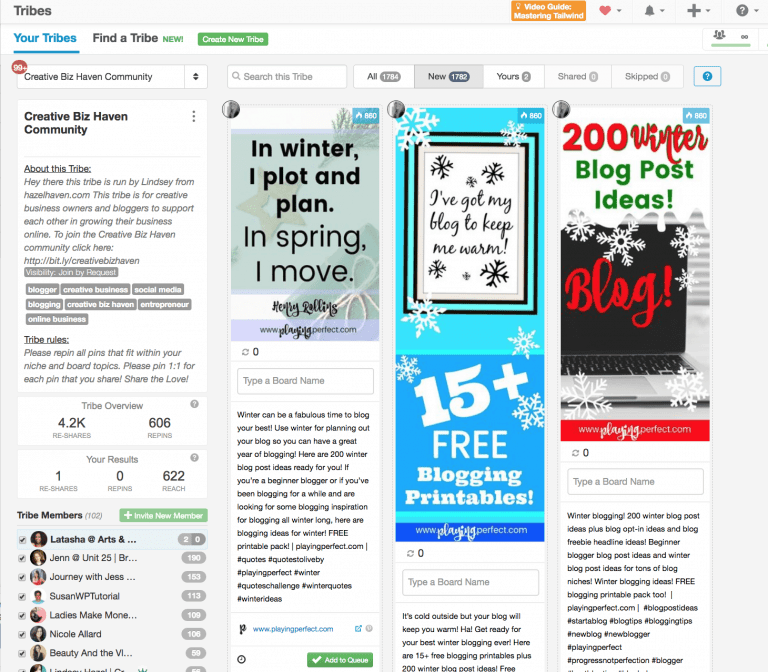 You can use Tailwind Tribes to connect with other bloggers to help promote your Pinterest pins. Which of your pins were repinned the most. The times your most popular pins were repinned. The number of followers you gained. As you may know, pinning consistently throughout the day helps to build authority on the Pinterest platform and when I first started Tailwind helped me with setting up a consistent pinning schedule. When I first started blogging I went from having close to no traffic to getting a ton of traffic after putting Tailwind apart of my Pinterest strategy. I share tips in this post on how I use Tailwind to boost my traffic in more detail. PRO TIP: Once you sign up for Tailwind make sure to install the Tailwind browser extension because it will make it super easy to pin your content daily right from your computer. There is a browser extension for Chrome, Firefox, and Safari. To learn more about the Tailwind scheduler click here! Tailwind Tribes are groups of bloggers and online business owners who exchange repins in a group on Tailwind. Once you get invited to a tribe you will be able to pin your pins to the tribes and find other relevant pins in the tribe to pin to your boards. Tailwind tribes are free to join and you can also purchase the a power up membership option if you really want to dive in and boost your traffic to get more exposure. Seen below is an example of how a tailwind tribe looks once you accept or get accepted into one. I recently checked my google analytics and noticed that some of my Pinterest traffic came from Tailwind tribes. 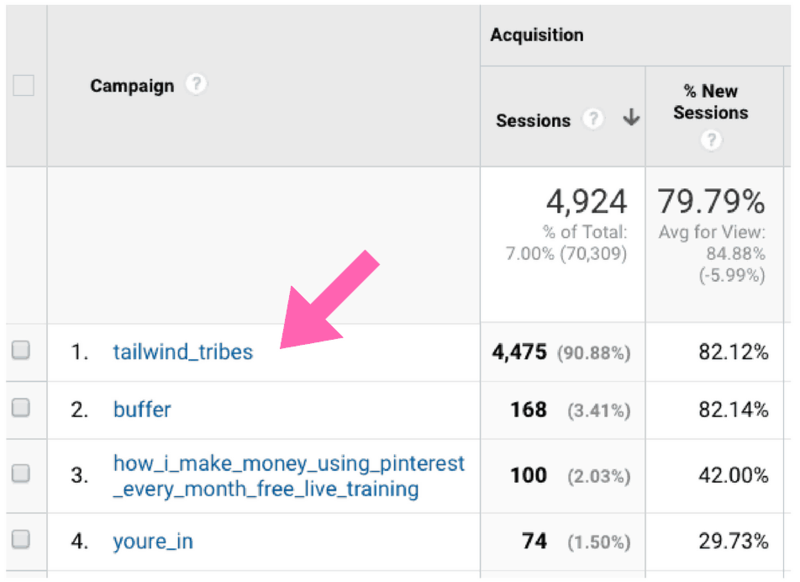 I was shocked to see Tailwind Tribes was number one in my campaign section for generating traffic to my blog from Pinterest. After seeing that I added Tailwind Tribes to my Pinterest strategy! Below you will see that the top campaign came right from Tailwind Tribes on my Google Analytics! Which means that Tailwind Tribes sent traffic to my site from Pinterest. Pretty cool, right? Because of that, I started to focus on Tailwind Tribes and even join Tailwind Tribes Power up Elite which is unlimited Tribe Membership and I get to submit to 400 tribes per month. You can drive a massive amount of traffic to your blog very quickly. You can find other relevant content from other pinners to pin to your boards daily that are high-quality. Pinterest favors pinners that pin high-quality content throughout the day. When you get to Tailwind the first thing you want to do is click on the tribe button located on the upper left side. Once you get the tribe section simply click on “Find A Tribe” and you will be able to find tribes by searching relevant keywords. 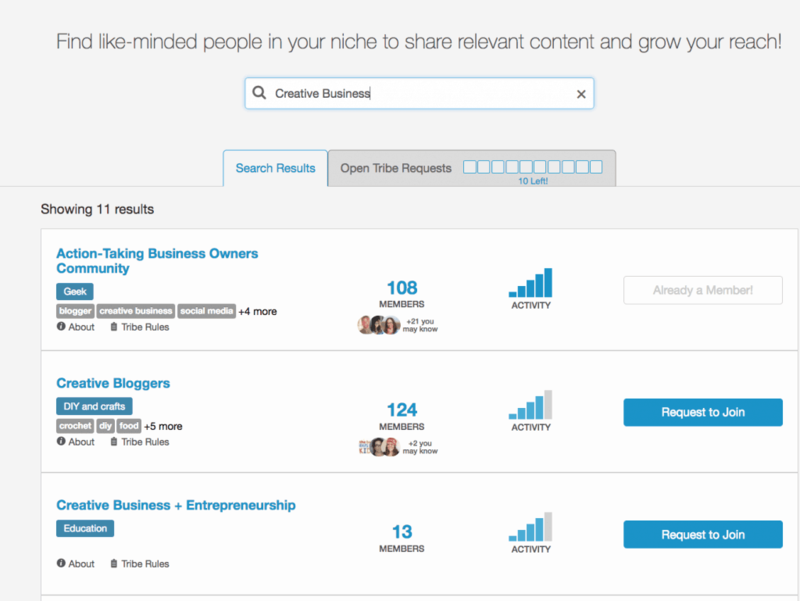 For example, below I typed in the keywords “Creative Business” in the search box and a list of tribes came up focusing on those keywords that I can request to join. After that, simply search through the different tribes and request to join the ones that stand out to you and that would be a good fit for your niche. Read the rules: Make sure to read the rules of each tribe when you join. Similar to Pinterest group boards, each tribe has its own set of rules. Some of the rules that an admin might put up are, “ Only pin vertical pins” and “For every pin that you put in the tribe you must repin 2 pins of other pinners content.”In the example below, you will see the rules for a Tailwind tribe that I am currently apart of. The rules are located on the left-hand side right under the group’s name. 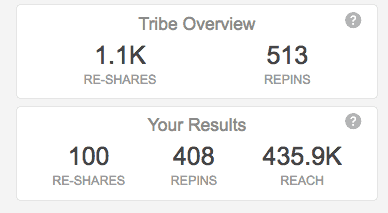 Share your pins: After reading the rules you are good to go to share your quality content in the tribe(s). Simply look through your pins on Pinterest and click on them and then click on the Tailwind button at the top of the Pinterest pins to schedule it to different tribes. I normally schedule 1 to 2 pins per day in each of my tribes. Check out the tutorial below to see how I currently schedule my pins from Pinterest to Tailwind Tribes. Share other pinner’s pin: You also want to make sure to share other pinner pins within’ each of your tribes. I simply go to each tribe individually and scroll through the tribe to find relevant content that I can share to my boards and add those pins to the queue to be set to pin to my relevant boards for that day. Check out the tutorial below to find out how I schedule other pinners pin to my boards from Tailwind Tribes. Review your Results: After that, you can review your results and study your results and the results from the tribe. Below you will see an example of my overall reach in the tribe and also the results of the tribe with shares the repin and re-share rates. You will be able to find this section right under the group’s name on the left-hand side. 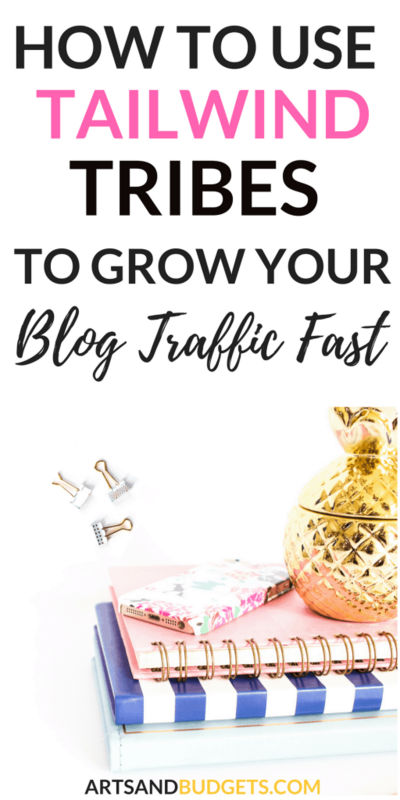 Recently, Tailwind tribes have been amazing for my traffic from Pinterest and have been amazing for finding new high-quality content that I can share to my personal and group boards on Pinterest. Some Tailwind Tribes that I am apart of that you can check out are Creative Biz Haven Community Tribe,, Bloggers Killin It On Pinterest and Blogging Tips! Also, if you are looking for new Tailwind Tribes make sure to check out the “Find A Tribe” feature at the top of your Tailwind screen. For more information about Tailwind and Tailwind Tribes click here! Do you currently have a Tailwind tribe open to new contributors? If so, leave it below in the comments! Ohhh great post! Thank you!! I tend to forget about using pinterest, and am really bad about scheduling stuff. Maybe this will help me! Great post! Tribes are definitely a plus, I had waited on joining any, but then was so glad I did! Hey Latasha! This is a power packed post! I use Tailwind Tribes and they’ve worked great so far. But you’ve encouraged me to actually reach out to get connected with even more Tribes. I stopped after the 15 or so I already belong to. Also loved that you added video tutorials to your post. Great resource. I’m going to pin this to a few of my blogging boards. Love your Stuff! This is fantastic, thank you for sharing! I am really hoping to grow my blog and have been trying Pinterest and keep hearing TailWind is how to grow. I’m just now reaching the point where I know I need to invest in a paid Tailwind membership so I can up my Pinterest strategy. Thank you so much for this post! Hey, I am Latasha! , I am a wife, mama to 2 boys and lover of God and all things pink! When I am not eating tacos I help creatives handle money the creative and fun way! Check out the rest of this site to find side hustles, make money resources, budget + saving hacks + tips. JOIN OUR TRIBE & GAIN ACCESS TO THE RESOURCE LIBRARY. The Library is filled with resources to help grow your blog + biz! First Name Enter your email address.